¶ Well this is a school, even if it is "Online", and every school has Homework. but unlike diagramming sentences in English class, this homework should be fun. First I want you to find, beg, borrow or buy (but not steal!) several items. A salvage yard would sell this stuff cheap or maybe a friend might have these laying around. 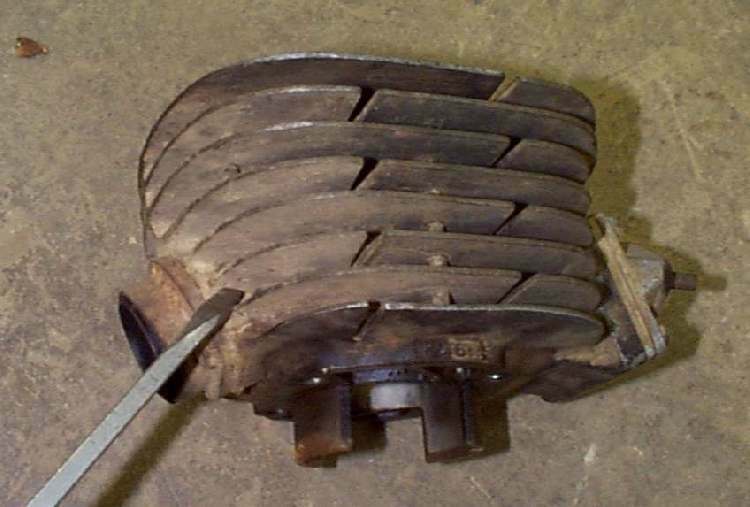 An old Motorcycle crankcase. It can be broken or dented but it must have a lot of it's screw holes in good condition...the threads have to be good. An old cylinder. It can be rusted but the fins have to be in good condition. A big bunch of bolts, nuts, screws, and flat washers in sizes from 6 mm on up to 12 mm. Strong sockets, of sizes to fit the bolts. Try to use impact grade sockets or at least the Guaranteed forever type. The rest of your tool box. First put on the safety Glasses, then I want you to take one of the 6 mm bolts, put a flat washer and 2 or 3, 8 mm nuts on it, then another flat washer. Now screw it into one of the threaded holes on the crankcase. Now I want you to take the Torque Wench and set it at 10 Lbs. Turn the bolt until the wench indicates 10 Lbs or it clicks. Not very much is it? Now take a 10 mm combination wrench and loosen the bolt and retighten, by hand. Check it with the Torque Wench and see how close you can come to 10 Lbs of torque. Do this a number of times. When you feel that you can reproduce this torque reliably, increase the amount by 5 LBs and then 5 Lbs more. Keep doing this until the threads in the crankcase strip out. I want you to get the " Feel " for the right torque for this bolt (7 to 10 Ft. Lbs) and for the torque that strips it out. We do this with a junk crankcase so you don't strip out a good one. Now, do the same thing again only this time put a steel nut on the bolt and put it in a vice. Go through the sequence again, going up 5 Lbs in torque each time, until something gives or breaks. Use the Chart below as a general guide. 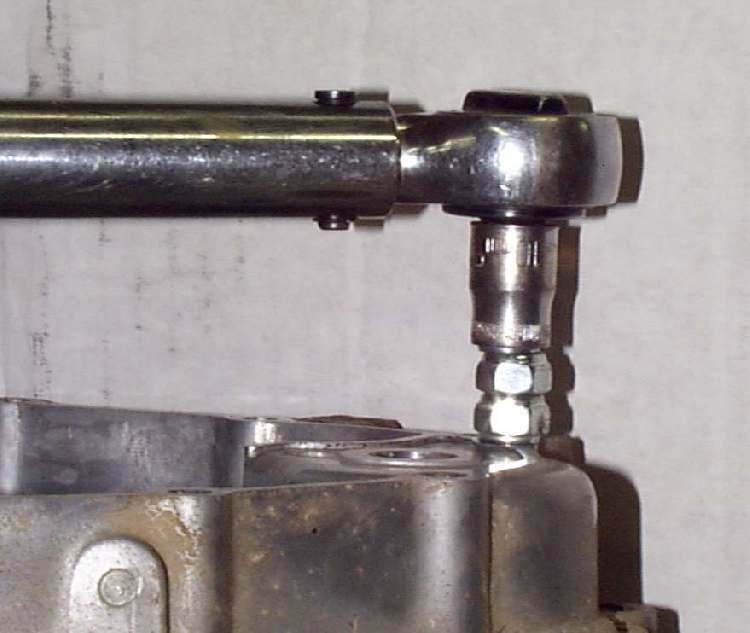 Do this with each size of bolt. 6 mm, 8 mm, 10 mm, 12 mm. Be careful when you do the larger sizes. You will need to use an a " Cheater ". This is a piece of pipe, that fits on the end of the wrench to give you more leverage. You don't need to break the bigger bolts. 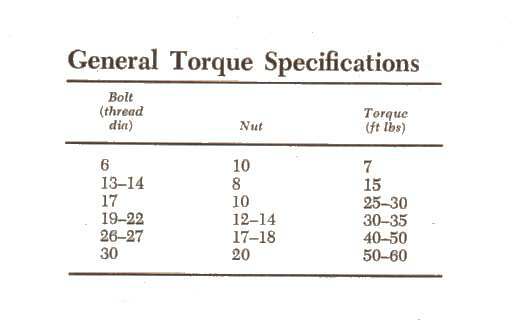 I just want you to learn the " Feel " of the different Torque settings. Use your head and don't get carried away. 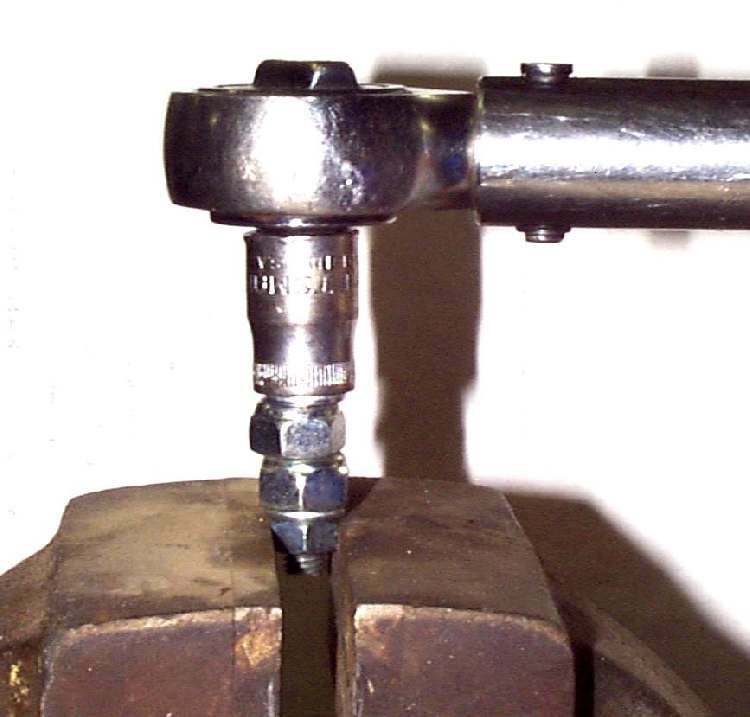 The object is to learn the Torque settings for different bolts and how strong they are, not to break bolts, although this may happen. 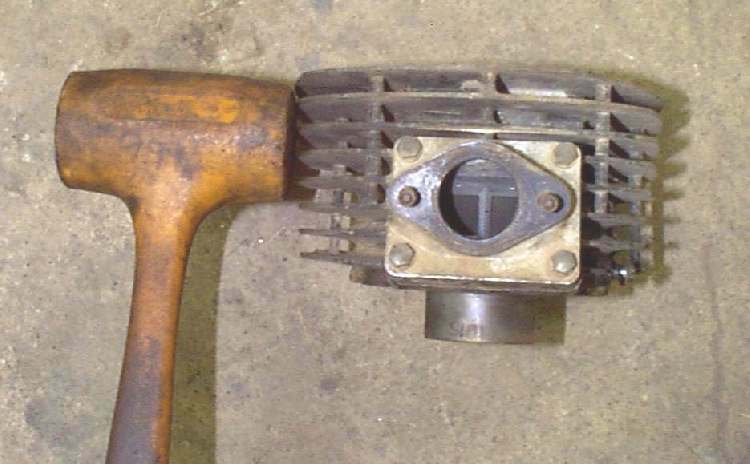 Take the Cylinder and with a big screw driver, break one of the fins off. You might want to put it in a vice for this. They break off pretty easy don't they? Now hit them dead, straight on with a big hammer. Didn't break did it? Now, hit it at an angle. It broke, didn't it? In other words, you can hit the cylinder fins dead on and they don't break, but if hit at an angle they do. This will be handy to remember when you run across a cylinder that is really stuck to the case. Try putting a large screw driver at the base of a fin and hit the end of the screw driver with a hammer. The fin doesn't break does it? Now try the same thing at the end of a fin . Breaks right off doesn't it? Experiment hitting and prying and levering the cylinder in different places. 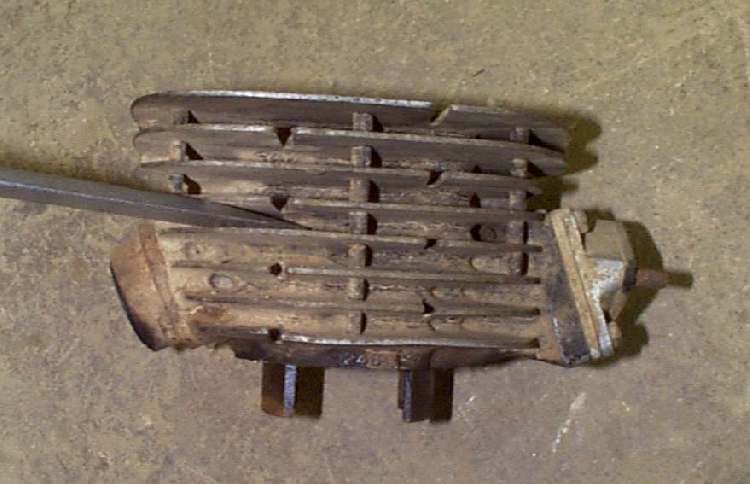 You may want to get another crankcase and cylinder from a different engine and practice some more. The more you practice the more money you will save. How, you ask? Cylinders cost hundereds of $$$ and helicoils run $15 each and more. If you don't break it, you don't have to replace it.